Hosted by Ma-Nu Lodge at Kerr Scout Reservation at Slippery Falls located near Tishomingo, OK, the weekend of May 3 – 5, 2019.Check out our Facebook page or REGISTER HERE. 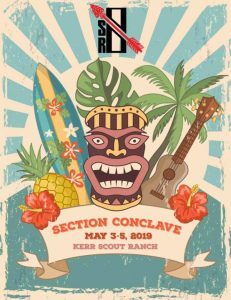 Conclave is a fun filled event which brings together all the Order of the Arrow Lodges from across Oklahoma and Arkansas in warm fellowship. Conclave will feature a visit from a National Officer and a full scale Native American Pow Wow. Many camp activities will be open including shooting sports. Throughout the weekend there will be opportunities for games and to win the coveted Golden Arrow. Kerr Scout Ranch will have their Cowboy Action Shooting program available that weekend. To participate, youth MUST HAVE their parent’s permission (not a leader). Have parent sign this form and bring it with you. Please note: All meals are included in registration starting with Friday night Cracker Barrel. Participants will receive a commemorative Section Conclave patch. All participants must bring, or plan to share, a tent. Electricity is limited and C-PAP user should consider bringing a battery system. All fees will be collected by the Section at time of registration. All BSA Medicals Part A&B will be collected through participant’s home lodge and must be submitted to your lodge contingent leader prior to Conclave. Please email the section leadership at LUX.BRIAN@ICLOUD.COM with any questions.